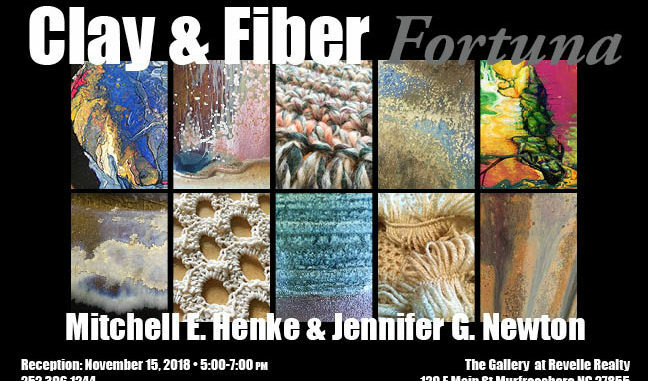 Come join us on November 15, 2018 from 5:00 to 7:00 p.m. at The Gallery at Revelle Realty for the Opening Reception of Clay & Fiber-Fortuna Exhibit with Mitchell E. Henke and Jennifer G. Newton. This exhibit will run through January 11, 2019. Please enjoy the results of the conscious process of composition that is behind the seemingly random work touched by Fortuna. The work presented begins with an idea, a vision, an intent. However, given the variability of natural materials, process, and the inherent influence of fortune, the intent is often transformed and results in unexpected outcomes. The coincidental and subjective movement in many of the pieces is desirable and represents the dichotomy between art and craft. 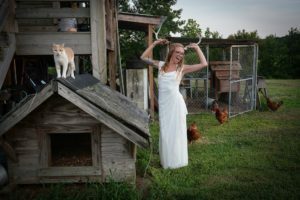 Henke has a background that includes experience in photography, printing, paper making, wood working and metal working. 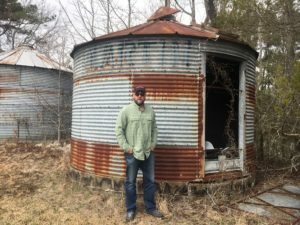 He has two patents and awards for corrugated and paperboard packaging and is currently a professor in the Graphic Communication program at Chowan University. In this body of work, Jennifer Groves Newton uses paint and fiber to explore the inherent tendencies of each of these materials individually. By giving the materials freedom to behave naturally – paint to flow, yarn to drape – she was able to generate abstract pieces that result from the artist’s reaction to material rather than, the usual, material’s response to artist.